Krusevo is a very unique, small city, settled on the Busava mountain high above the nearest city, Prilep (in the Pelagonija valley). Krusevo is 32 kilometers away from Prilep, while from the capital Skopje, is 159 km away. 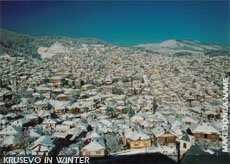 Krusevo lies of an altitude of 1,250 meters above the sea level and is the highest city not only in Macedonia, but in the Balkan Peninsula. Today Krusevo has around 9,821 citizens and it represents a tourists center. 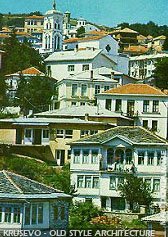 But one century ago, Krusevo had a population of more than 14,000 citizens mostly Macedonians and Vlachs. But every corner here tells his own history. Krusevo is a city with it's own architecture, as those in Veles, Ohrid, Kratovo. It was all in that August 2nd (St. Eliyah's Day), in the summer of 1903 in Krusevo, when the Macedonian and Vlachs rebellions, attacked the Turkish military building and started the rebellion for national liberation. At the end of the day they liberated Krusevo and proclaimed the first republic on the Balkans, the Krusevo Republic, which survived only 10 days, due to the Turkish aggressions. A government was formed by Dinu Vangeli, and as a president was chosen Nikola Karev, one of the leaders of the rebels and member of the Internal Macedonian Revolutionary Organization (I.M.R.O.). On August 13th 1903, the Turks marked the end of the republic. The city was burned down, many of it's citizens were killed. Due to this events at the beginning of the 20th century, every year on August 2nd, a celebration is held in the vicinity of Meckin Kamen, (where the duke Pitu Guli died, in the last battles against the Turks). During the celebration Krusevo wears a festive look: on the balconies and at the windows of all the houses shaggy hand-woven blankets in all kinds of colors are exhibited. On the mountain Busava, there is one the famous ski-resort in the Republic of Macedonia. Krusevo is a important winter and summer tourist center. 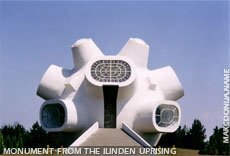 Almost every house here in Krusevo is a monument. Some of them are the houses of the famous Macedonian painter Nikola Martinovski, then the museum house of the president of the Krusevo republic, Nikola Karev. Simply, Krusevo is mentioned as a museum of old and traditional Macedonian architecture. Krusevo is one of the places with plenty monuments in the surrounding area. 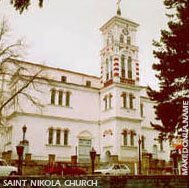 Some of them include: the famous and the biggest monument in honor of the Krusevo Republic, Makedonium which symbolizes the struggle for liberation of the Macedonian people, then the place Meckin Kamen, where the troops of the duke Pitu Guli, fight against the powerful Turkish army, the church dedicated to St. Nikola, (built during the renovation of Krusevo, after it was burned by the Ottoman Turks), the church St. Jovan and other.